Author’s Note: Star Wars Celebration Anaheim was 5 months ago. Now with time to gain perspective, I reflect on the encounter. I have loved Star Wars since somewhere around age 8, but in roughly the past year I have connected with more Star Wars fans than ever before. Writing articles, podcasting, and the ever-going party that is Twitter has meant that Star Wars conversations of varying depths could happen at virtually any time. Bonding with other fans over the years came out of the stories from that galaxy far, far away that were found not just in the films but in books, video games and even the tales we’d made up in our heads. 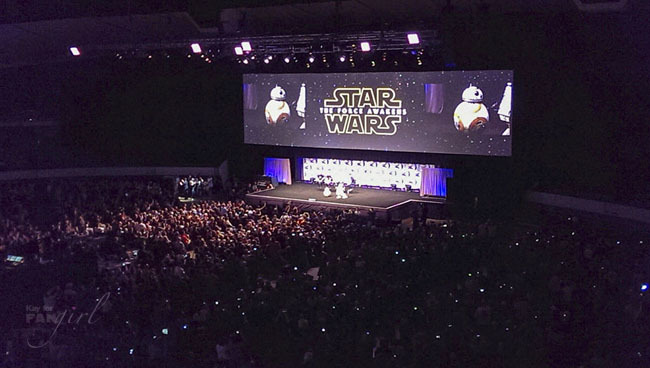 However in the online realm there hadn’t been anything quite so universal and instantaneous in the wider fandom as the release of the first teaser trailer for The Force Awakens. 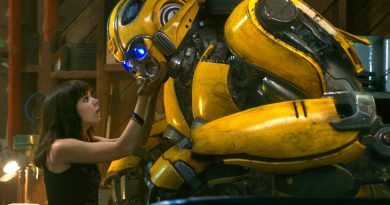 It left so many of us giddy, hopeful, and intrigued – even after we realized that we still didn’t know much about the film. Soon enough that internet experience would be completely eclipsed by experiencing the surge of excited energy, hearing the deafening roar of X-wings mixed with a crowd’s cheers, and crying tears of joy that all came from watching the second teaser trailer in the same room with 5,999 other Star Wars fans in Anaheim, California. And we still didn’t know all that much more about this movie. 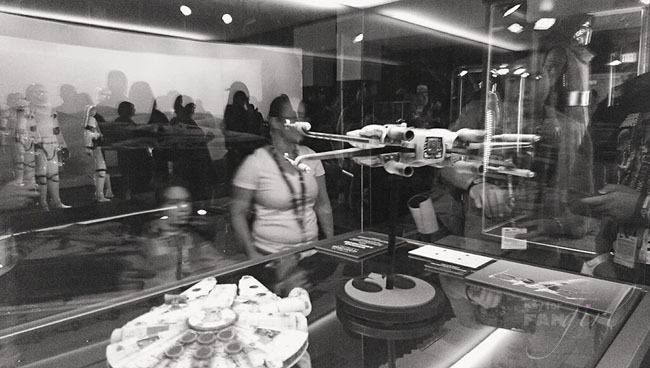 Visitors stream through The Force Awakens exhibit at Celebration Anaheim. 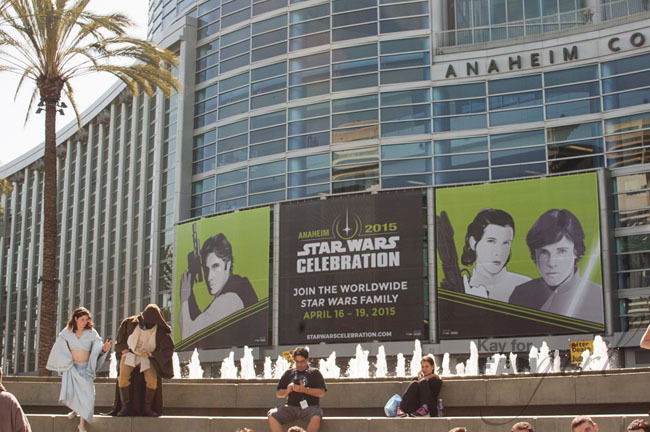 When I bought my ticket to Star Wars Celebration Anaheim over a year and a half before the event, I wasn’t sure who would go with me or if I’d know many people there. I had no idea what panels would be offered or where my level of interest in the new movie would rank. Still, I felt it in the Force; the time had come to trust things would work out and finally convene with the Star Wars kindred. In all honesty I was prepared to see the mean sides of fandom as well as the good. Never having been to a Star Wars Celebration before, I didn’t want to go in thinking everyone was going to be nice to each other only to have my interest in Star Wars questioned because I’m female or because I blanked on the length of a Star Destroyer. And you know what? That did happen. One time. One person declared it odd that I was a woman who liked Star Wars so much. Everyone else I crossed paths with was accepting. By this point you may have heard several people describe Celebration as one big family. It really does feel that way. People of all ages, genders, and races all touched in some way by that story from a galaxy far, far away are all in one place. Even if you aren’t the kind to typically strike up a conversation with strangers, you can easily find yourself doing just that. It was such a magical and wonderful experience that many of us found it very difficult to leave. Getting to see BB-8 for the first time in person. No idea how I managed to take this photo because I was tearing up at the time. 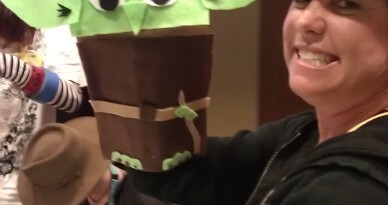 In addition to the camaraderie of the attendees, there was Lucasfilm – the guiding hand in the whole event. These days it’s not that often that we as consumers feel welcomed, appreciated, and even celebrated by the companies we engage with and here was Lucasfilm giving everyone there what felt like a big hug. Although it’s hard to recreate the buzz of being at the Anaheim Convention Center, the effort was made to reach out to all the fans who couldn’t attend via live-streaming of panels and interviews. They even went a step further and have those videos on their YouTube page right now so you can still catch many things you might have missed whether you were there or not. At the end of that opening ceremony, I turned to fellow FANgirl contributor B.J. and said, “I’m good. I don’t need a single thing more from this convention.” In a matter of only five hours I’d gotten to experience nearly everything I had looked forward to. As I’d mentioned in our Hyperspace Theories pre-Celebration show, I knew there were a lot of Star Wars fans, but I’d never gotten to see a big group of them in one place. Now I had. I only spent four hours in line before the panel but that line was part of the experience. I met people I’d only known online. I met new fellow fans. We shared in the thrill of finding out we were going to the live Celebration Stage stadium after being led to think we were queued for a satellite room. And on top of that I put in time cosplaying a Star Wars character. Once inside, I got to hear both Kathleen Kennedy and J.J. Abrams speak in-person. They said things I’d hope they’d say regarding the inclusion of women in the stories and using practical effects. BB-8, the technical marvel, amazed me. We got to see legacy cast members (as Carrie Fisher refers to them) and our new trio. There were photos. There was that trailer… twice. Lightsabers were swinging around. The child inside us all was beaming. Every single person in that space was enjoying it all together. I honestly can’t recall ever experiencing a moment quite like it in my life. The energy was mind-boggling. If that’s not already enough to feel connected, there’s also that aforementioned cosplay. 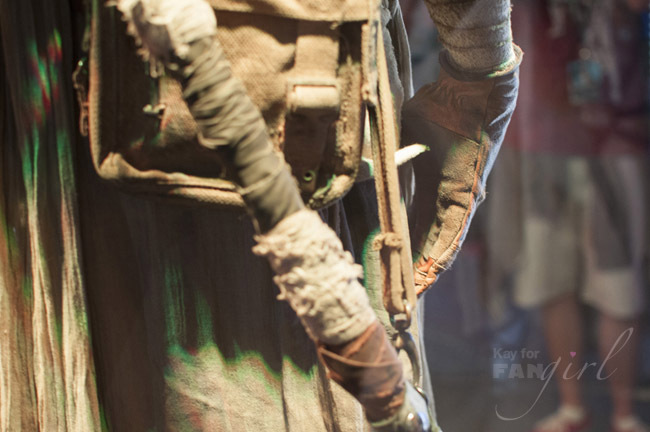 Close-up with Rey’s The Force Awakens costume – aka my own personal Star Wars wonderland. Three of my four days at Celebration Anaheim, I was dressed as Rey from The Force Awakens. Yes, I’m just crazy enough that my first cosplay at my first Star Wars convention would be from a movie that wasn’t even done being edited yet. Something about Daisy Ridley’s character in those mere seconds of that first teaser drummed up this great hope for another fantastic female lead in the Star Wars saga and I was compelled to translate that into a physical manifestation. It sounds slightly melodramatic, but no one had to ask me if I was excited for The Force Awakens. I was a walking billboard of enthusiasm. 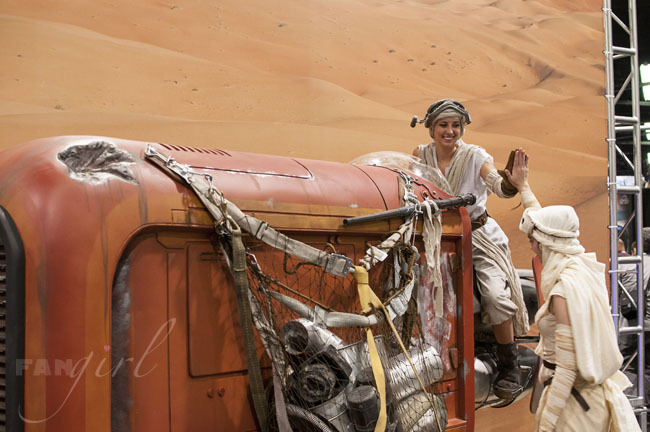 As Rey, I high-five Rey. I’m pretty sure this doesn’t happen in The Force Awakens. It lead to enchanting experiences too like being summoned to climb up on Rey’s speeder and have enlightening conversations with members of the impressive Belgian propmaking group who built it. 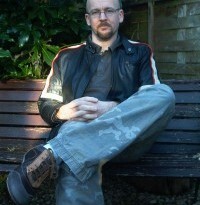 And there was the momentary dumbfounded sensation at being invited into the official website’s Cantina set. Would I like to practically step into the world of Star Wars for a little while? Yes, please and thank you. 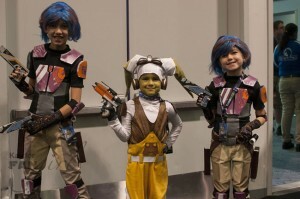 Sabine, Hera, and Sabine from Star Wars Rebels. Look at that happiness. Look at it. And if that wasn’t enough to feel part of something bigger, then there were the children. Parents told me how excited their kids were about Rey and how much their little girls loved Star Wars. At one point I turned just in time to see one girl bound towards me dressed in a Her Universe Ahsoka tunic with all of Ahsoka’s markings painted on her face. I told her how cool her outfit was. She asked for a photo with me and after her father took it, she looked up at me and said, “I love you.” This was quickly followed by her hugging me very tightly. Now I tend to get along well with kids, but this is certainly not something I can say happens often. I can only imagine this is how Princesses at Disney Parks and stuffed animals feel. If there comes a time where Rey isn’t being represented in action figures or staffs or apparel or what have you, I will be writing on behalf of that little girl. Star Wars meant the world to me for so many reasons when I was her age. Clearly it still means a lot to me now. Asking a costumer about their costume is usually a good idea. 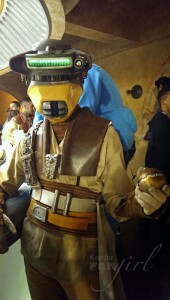 Talking to this Boushh in the Cantina was fun. Connecting with the Star Wars community in-person is a rewarding experience. For every relative or friend or stranger on the bus who gave you the side eye when you showed your Star Wars love or asked you why you’re still into that kiddy sci-fi thing, 50 fellow fans are there happy to celebrate it all with you. Whether you’re into the films, TV shows, books, games, collecting, music, costuming, merchandise, droid building, apparel, art, or just having a good time, there is something for you at Star Wars Celebration. Before one of the later panels, DJ Elliot remarked on how cool it was that you could look at anyone in that convention center and instantly know that you had something in common. And let me tell you, as big as it is, Star Wars Celebration is a microcosm of what it’s like when we let what we have in common be stronger than what separates us. It’s a world of contagious smiles and thank yous. It’s a domain of open discussion and sharing stories. It’s a place where age and how long you’ve been interested in this topic doesn’t seem to matter all that much. All that matters is this story has touched your life in some way. So if you love Star Wars and have the opportunity to attend a Celebration, please jump in. It’s worth it.